My civilized name you can read above, but when my feet are covered by moccasins I’m also known as Char. The name derives from an incident with a tin cup warming by the fire at the AMM Nationals in 2004. Being a bit disoriented at the time I put the warm side to my mouth and literary got a charred lip; hence Char. My persona is that of a Rocky Mountain trapper from the 1830s, also known as a mountain man or mountaineer. A character I try to emulate as truthful as possible in both gear and through experience. I live in Sweden, so that’s where I spend most of my nights under the stars. Since 2006 I’ve had the pleasure of doing this with my brothers and sisters from the Scandinavian Mountain Men (SMM) which my friend Mike Nilsson and I founded. The SMM consists of a small bunch of North American fur trade enthusiasts that just like me loves to get out on the ground putting ourselves and our well researched gear to the test. Since you are reading this at our SMM website we need no further introduction. My first visit to the Rockies was in 2004 when I traveled the great West following the trails of the original mountaineers. This was also my first real contact with the great American brotherhood known as the American Mountain Men (AMM). A few years later I was given the opportunity to become a probationary member (pilgrim) and in 2011, with great help from my friend and sponsor "Teton Todd" Glover, I finally managed to pass the mandatory requirements* (found below) and became a full AMM member (bossloper). My AMM membership number is # 2035. Since my first visit to the western fur trade country in 2004 I have been fortunate to make similar trips in 2010, 2012 and 2017. Fur trade related pictures from those adventures can be found in our gallery in the menu to your left. ∙ 1 Must have a full set of hand-cut and -sewn clothing and handmade accoutrements. These must be researched for authenticity of the 1800-40 period and be of a type which would have been seen on men in, or moving to, the Rocky Mountains. Rifles, saddles, traps, blankets, and other accoutrements that would normally have required the work of a specialized craftsman need not be handmade, but must be as authentic as can be purchased today. My dress and gear are subjects to constant change as new information and knowledge is acquired. I have studied artwork such as that by Alfred Jacob Miller, fur trade ledgers, journals, museums, contemporary research and other documentation from the Rocky Mountain Fur trade. Choice of materials, construction methods and patterns are based on that research. I have hand stitched all of my clothing using waxed linen thread or genuine sinew, and most of my gear if not made by me has been chosen with the period in mind. Presented here is my dress and gear used during the spring of 2011 (has been updated and changed since). The sources used are only mentioned in general terms. For specifics please contact me. On my feet I wear moccasins of either pucker vamp or side seam style. Inside I wear nothing or a pair of “fotlappar” i.e. pieces of blanketing as described by Osborne Russell. My legs are fitted inside smoked buckskin pantaloons with a narrow front fall, pockets and buckskin covered wooden mold buttons. Pantaloons show up frequently in both fur company ledgers and the art of Miller. Mine are cut by the knee as mentioned by Joe Meek and completed by a set of bottom tab leggings of the same material. I always use at least one fabric shirt of the square cut pattern. Printed cotton calico, weaved checks or stripes and wool flannel are some of the different choices I have in material (MFT and fur company ledgers). Sometimes I wear a single breasted vest of a shawl collared pattern inspired by originals found in the Museum of Civilization collection. It is fronted with dark/light blue striped wool, lined with white linen and backed by fustian. The back is adjusted weaved cloth straps and it’s closed by wool covered wooden mold buttons. My frock coat i.e. hunting shirt frequently shown in both art and described in written records is made from smoked buckskin using a pattern from the period. It has a keyhole back, notched collar and tailor fitted arms. It is fringed along the shoulders and arms and closed by buckskin ties. My 1 ½“ leather belt holds a early 19th century patterned 7” butcher knife (Partial tapered tang, three iron pins and beech wood handle) kept in a “shop made” sheath made from black leather held together by copper rivets. Next to my sheath hangs a bait bottle made from aspen wood. Around my neck I wear a Gage’d Amore adorned with quills and beads holding my clay pipe (Miller and Ruxton). I also wear a red cotton or a black silk handkerchief (fur company ledgers). On the top of my head I usually wear a low crowned wide brimmed white wool felt hat (Miller and fur company ledgers) or a hunters hood inspired by Miller and Kurz. My bullet pouch is made from smoked buckskin decorated with three lines of quillwork inspired by Millers artwork. It contains bullets, some patching, strike a light kit, tobacco, extra flints and the necessary tools to keep my rifle working. Also slung across my shoulders is my buffalo powder horn copied from a period original at Museum of the Fur Trade. My armament other than my butcher knife consists of my Northwest trade gun. My version is made from antique Swedish parts (lock and barrel) similar to the originals. The stock and remaining hardware are new and made to complete the transformation to a “trade fuse” so common in fur company ledgers. My list of camp gear is extensive and varies depending on the season, mode of travel, single person camp, group events, rendezvous etc. So I’ll just list the basics used during all of my outings. For bedding I use a white three point double blanket with black bars and a buffalo appishmore all wrapped in a hand stitched oilskin tarp. In cold weather I skip the blanket and use a buffalo robe instead. I usually bring a small tin kettle (part of a nesting kit) which in addition to my tin cup, a horn spoon and a small frying pan with a foldable handle (Stewart) serves as my cooking gear. In addition to this I always bring my sewing kit, a bullet mold, lead ladle and some lead; brass wire for repairs, an axe and some other “foofaraw” such as a deck of cards and an extra pair of moccasins. I carry this stuff in a “market wallet” or slit pouch type of saddlebag as mentioned by Charles Larpenteur made from heavy duty oilskin to protect its contents from the wet moss covering Sweden. ∙ 2 Must have spent at least two days and one night in a primitive camp during each season of the year. -2 days 1 night Feb 26-27 2010; Snowshoe trek along Gästrikeleden. -3 days Apr 9-11 2010; Spring ride in Västergötland . ∙ 5 Must be able to demonstrate the skills needed for primitive survival in the wilderness of his area and must be willing to teach said skills to other members when requested by a Party Booshway or Director of this Association. Since my "area of wilderness" is the forests of Sweden, my survival skills are based mainly on conditions, flora and fauna found here. Basic survival skills such as fire making, shelter making and finding food in the wild are constantly used, developed and demonstrated on treks, during camps and even at rendezvous. ∙ 6 Must be able to demonstrate trapping ability using steel traps, snares, and traps made from natural materials found in the area. As many states do not allow the use of some, or any, of these traps, the actual taking of game is not required, although it is suggested where possible and legal. -Demonstrated my ability to use steel traps in Pine creek close to Pinedale WY, July 9th 2010 together with my sponsor Teton Todd Glover. 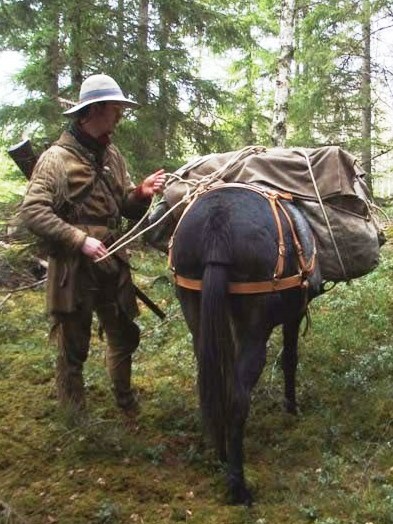 ∙ 8 Must be able to demonstrate the ability to properly pack a horse, canoe (or bullboat), or a man for distance travel under possible adverse conditions. -Demonstrated my ability to properly pack a mule using panniers, top pack (bedroll) and top tarp during spring ride April 9-11 2010. -Packed my canoe in and out from Primitive Rendezvous in July/Aug 2010. -Packed my toboggan during a winter trek Jan 21-23 2011. -Packed my canoe July 5-6 2011 for two days down Härån (river). ∙ 10 Must be able to start a fire in wet, as well as dry, weather using flint and steel or fire drill using tinder and wood found under natural conditions. -February 26-27 2010 in rain with three feet of snow covering the ground. Found dry thin birch bark as tinder and dried it inside my hunting shirt. Made fire with flint and steel. -April 9-11 2010; found dried bracken for tinder. Made fire with flint and steel. ∙ 13 Must be able to cook a meal of meat using only the meat, fire, a knife, and materials found in nature. -Prepared a hump rib during spring ride 2010 April 9-11 using, stick, knife and fire. -Prepared buffalo steak on stick during AMM nationals 2010. -Demonstrated the use of a cooking pit and used it to cook a trout during Primitive Rendezvous Sep 23-25 2011. ∙ 14 Must be able to converse using Plains Indians hand talk. The 200 words on page 64 of Tompkin's book "Indian Sign Language” will be used as a basis for conversation. To complete this requirement, you must demonstrate your ability to read the signs for 50 words, as well as to give the signs for 50 words. -Passed this requirement in Pinedale 2010 with my sponsor Teton Todd Glover. ∙ 19 Must spend three days and two nights totally alone under primitive conditions and aux aliments du pays ["off the nourishment of the land"]. -April 17-19 2011, Spent three days and two nights on mainly cow biscuit, pine needles, and birch sap. A longer version can be read by clicking here. ∙ 20 Must have made a study of the life style of the mountain man, frontiersman or American Indian before 1840 and must submit a report of this study to the association Capitaine. Turned in my study on games played during rendezvous named: “There goes hoss and beaver” to my sponsor and got it approved April 24 2011. The paper was also published in the 2011 summer issue of the Tomahawk & Long rifle. If have any questions or just want to get in contact, use the e-mail address found by clicking at “Members” in the menu.